This is a post a wrote 2 years ago, I never published it, don’t know why. It feels kind of weird to read it now: in the meanwhile I had another kid, quit my job, started organizing meetups (and a conference) and started speaking at conferences too. In 3 words: Life went on. 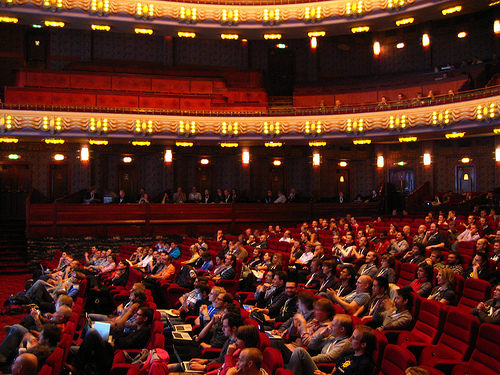 But still Fronteers 2010 has been a landmark in my following choices: I quit my job because they were not investing enough in my professional development, I started organizing meetups (and then the conf) because I wanted to help creating a frontend community in Italy. Starting from the end: Christian Heilmann’s talk was like an enlightenment for everyone at the venue. Nothing really new came up from the conference: almost everything was already heard (except Cameron Adams talk about web animations), but still was really inspiring to listen to such great speakers talking that passionate about what we are doing everyday. Going to fronteers was the highest point of a road that I’m running since 8 month ago. That can sound pretty weird as it can may create performance issues and we won’t be able to use some framework cool features if we don’t implement them on our interface. but we are having a lot of issues in upgrading our current framework (prototype 1.4): we have a lot of code built on that and we are not in a technology driven company that can invest so much resources refactoring code without any marketing goals. if we did not do something to solve that we would have had even worst problems then having the inability of chaining with jquery, for example. In this 8 month (not just working on that: as I told before marketing goals are on top of our agile boards) I studied a lot of solution to manage the architectture of all that stuff and I found out I’ve been passing through the same problems Jake Archibald had when he worked on glow with the bbc team and we arrived at the same conclusions. Also, I looking for some stuff, beside some known and well documented best practices, that I couldn’t find anywhere on the web (for example something to create a consistent unit test platform ant driven. there were several solution, but some of them were not console driven or library agnostic or were to complicated to integrate and use in everyday workflow) and recently we discovered that there is a new o’really book that is on publishing about that manner. So it seems we made the right choices afterall and I am proud of our team: we were not really ready to manage all that complexity but in spite of that did really a good job and now we are ready to go further on that. (ego boost was when Zakas said that we were going in the right direction to solve some performance issue we are having in old IEs). never been so proud of doing my job. Jake Archibald | Reusable Code, for good or for awesome! | Fronteers 2010 from Fronteers on Vimeo.